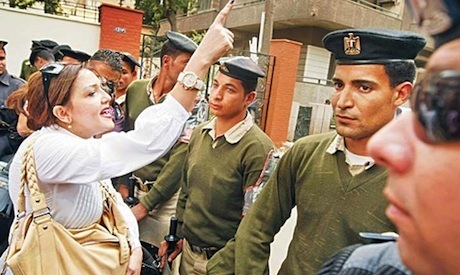 File photo showing Gamila Ismail, a leading figure in the democracy movement in Egypt, confronting police in the course of the 2010 electoral campaign. She is running again in the 2011 post-revolution parliamentary poll. With electoral campaigns scheduled to begin on Tuesday, more than 15,000 candidates are gearing up to vie for seats in Egypt's first post-Mubarak parliament. By the time the official candidacy registration period ended on Monday, a record number of would-be candidates had registered for next month’s polls for the People’s Assembly and Shura Council, the lower and upper houses of Egypt’s parliament. Initial figures reveal that more than 15,000 candidates in total registered for the contests, both as independents and as party-based nominees. Of these, more than 8,600 registered as independents competing for the one third of the parliamentary seats reserved for individual candidates in both houses. Those who registered to compete for seats in the People’s Assembly stood at nearly 6,600, while those competing for seats in the Shura Council stood at more than 2,000 – an unprecedented number. Between 6,000 and 7,000, meanwhile, registered for the remaining two thirds of the People’s Assembly seats that will be decided based on proportional representation. Polls for the People’s Assembly will be held under full judicial supervision over three stages, beginning on 28 November and ending on 10 January. The number of People Assembly seats up for grabs stands at 498. Another ten will be appointed, bringing the total number of seats in the assembly to 508. Shura Council elections, meanwhile, are set to begin on 29 January and end on 11 March. Candidates will vie for 180 seats in the upper house, while 90 seats – one third – will be appointed. The candidate registration period, initially intended to last one week, was extended by six days until 24 October. The extension proved necessary in order to help newly-licensed political parties finalise their candidate lists and complete the necessary paperwork. The final day of the registration period saw as many as 1,464 candidates register. More than 55 political parties have registered to take part in the polling, some 35 of which only came into being following Egypt’s revolution in January. They have submitted more than 350 lists of party-based candidates to compete in 46 electoral districts throughout the country. On 25 October, Abdel-Moez Ibrahim, chairman of Egypt’s Supreme Electoral Commission (SEC), announced that the five days following the end of the registration period would be devoted to revising candidate lists and examining appeals filed against candidacy bids. The commission will issue a final report on the lists and appeals on 30 and 31 October. Final candidate lists are scheduled to be announced by Tuesday, 1 November, said Ibrahim. “Once lists are announced, candidates can begin their election campaigns,” he said. According to Ibrahim, Cairo boasted the highest number of independent candidates – 1,468 – along with 79 lists of party-based candidates. The relatively sparsely populated South Sinai Governorate, meanwhile, saw the fewest number of registered candidates. Ibrahim explained that SEC regulations ban candidates from employing religiously themed electoral slogans or financing their campaigns with foreign funding. The SEC has also placed an LE500,000 ceiling on campaign expenditure for independent candidates, and an LE1 million expenditure ceiling for party lists. The final hours of candidate registration saw several surprises, not least of which was the large number of new faces affiliated with revolutionary youth groups that opted to register as independents. This latter category includes Asmaa Mahfouz, former member of the April 6 youth group; Kefaya protest movement founder George Ishak; Amr Hamzawy, political analyst and a founder of the Egypt Freedom Party; Gamila Ismail, former television presenter and ex-wife of opposition leader Ayman Nour; human rights activist Nasser Amin; and actress Tayseer Fahmi. Another surprise was that Mortada Mansour, controversial lawyer and former Zamalek football team chairman, registered to run in the Nile Delta governorate of Daqahliya. This comes in spite of the fact that Mansour currently faces charges of conspiring to kill unarmed protesters during the recent 18-day uprising. In spite of the unprecedented number of candidates, battle lines in the looming parliamentary polls appear to have already been drawn. As was expected, four major party-based alliances dominated the registration process. At the head of the list is the Democratic Alliance, led by the Muslim Brotherhood’s recently licensed Freedom and Justice Party (FJP). The alliance also includes the Nasserist Karama Party, headed up by potential presidential contender Hamdeen Sabahi, and the liberal New Ghad Party of veteran political activist Ayman Nour. The FJP will field more than 500 candidates countrywide – both as independents and on party lists – for both houses of parliament. These include most of the Brotherhood’s 88 former MPs who sat in the 2005-2010 People’s Assembly. Many believe that one of these, lawyer Sobhi Saleh, could be Egypt’s next parliamentary speaker if the FJP secures a parliamentary majority. Out of the FJP’s 500-plus candidates, 100 will run for seats on the Shura Council. The most prominent of these is Hussein Ibrahim, a former People’s Assembly deputy for the Muslim Brotherhood. Ibrahim, many political observers believe, could become Shura Council chairman if the FJP wins a majority of seats on the consultative council. The Democratic Alliance’s candidate list also includes prominent non-FJP figures, such as political analyst Wahid Abdel-Meguid and former Karama Party MP Saad Abboud. Islamist forces are also a main component of another alliance, comprised mainly of Salafist parties, such as the Nour Party, the Asala Party, and the Jamaa Islamiya’s Reconstruction and Development Party. This alliance will field close to 300 candidates across Egypt for both houses of parliament. The moderate Islamist Wasat Party, meanwhile, a Brotherhood offshoot, represents yet another electoral force to be reckoned with. Wasat will field a total of 402 candidates, 332 of whom will be featured on party lists while 70 will run as independents. This brings the combined total of candidates associated with the three main Islamist forces – the FJP, the Salafist bloc and Wasat – up to 1,200 independents and more than 400 on party lists. The Egyptian Bloc, meanwhile, an alliance between mostly liberal and leftist forces, is set to be the main electoral rival to the Islamist forces. The bloc is comprised of the Free Egyptians Party, founded by Coptic billionaire Naguib Sawiris; the Egyptian Social Democratic Party; and the leftist Tagammu Party. According to bloc leaders, the alliance will field some 350 candidates. Bloc officials further explain that 50 per cent of their candidates are affiliated with the Free Egyptians, 40 per cent with the Social Democrats, and the remaining 10 per cent with Tagammu. Prominent names on the bloc’s candidate lists are former MP Mona Makram Ebeid; political analyst Emad Gad; Tagammu Deputy Chairman Samir Fayyad; constitutional law expert Nour Farahat; and revolutionary youth leader Ziad El-Oleimi. Joining forces with the Egyptian Bloc is the liberal Wafd Party. According to Wafd Chairman El-Sayed El-Badawi, the party will field a total of 570 candidates, both as independents and on party lists. El-Badawi noted that the party’s lists included 37 Coptic-Christians and 87 women. The Revolution Continues (RC) is yet another electoral force that brings together most new secular revolutionary youth groups. The RC includes the Socialist Popular Alliance Party (a Tagammu offshoot); the Egyptian Socialist Party; Egypt Freedom; Equality and Development; the liberal Egyptian Current (a Muslim Brotherhood offshoot); and the Revolution Youth Coalition. This alliance has submitted 34 lists comprising 286 candidates in 22 governorates. Although it was formally dissolved in April, and many of its former senior officials face corruption and murder charges, the National Democratic Party (NDP) of ousted president Hosni Mubarak is also considered a potentially major electoral force. During the just-ended registration period, as many as 300 former NDP members are said to have joined the electoral lists of two parties: the Horreya Party and the Egyptian Citizen Party. While most of Horreya’s ex-NDP candidates are concentrated in Upper Egypt, those of the Egyptian Citizen Party are based in the Nile Delta. Another NDP offshoot, the National Egypt Party – led by prominent politician Talaat El-Sadat – has reportedly included as many as 60 former NDP members on its party lists. Another 60 former NDP MPs, meanwhile, are said to have registered as independents. Are there candidates/parties who believe in limited government? Are the 4 year terms for each House a limitation on the voters who may want to replace them after 2 years? Will the Single Vote system encourage just 2 large factions, as in the U.S.? What's the difference the revolution made if one third of the parliamentarians are appointed? Everyone who want's to run for a seat on the Parliament to be elected by the people they want to represent. I think, what the people are yearning for is to have a parliament that will put their interest first and serve them well. . Real freedom comes when the country is led by people who want to serve the people they represent.